Movie Streams provide an alternative to the Action generate movie command menus for generating movie files. They are a little more difficult to use than the batch processing oriented Action menu commands, but also give you more flexibility over how individual movie frames are generated. An Image Stream is essentially the same as a movie stream, except the individual frames of the generated movie are output as individual numbered frame images into a folder. You can think of a Steam as an open movie file that frame images can be written to either manually or at specific times you specify. To open a new movie or image stream use the appropriate File : Stream menu as shown above. The other stream menu options will be grayed out until you have a stream open. The Write Frame menu lets you manually write the current canvas view as a new frame in the open stream. The Flags menu options let you turn on automatic frame writing for different situations. AutoWrite is an option that when turned on will automatically write frames based on a timer. You can set how often frames are written out when AutoWrite is enabled in the Movie Preferences. The screen snap of the movie preference dialog below shows that AutoWrite is setup to write frames at 15 frames per second when AutoWrite is enabled. Enable Always AutoWrite will start writing frames immediately as soon as it’s turned on and will continue to do so whether you are doing anything in Studio Artist or not until it is turned off. Enable Gated AutoWrite will only write out frames when you are doing something (like painting manually or automatically, or after a processing operation like an image operation is complete). The Gated AutoWrite option is useful because otherwise you may generate movie files with extended periods of inactivity. Enable Write on Op End will automatically write out a frame whenever an operation (manual or automatic) in Studio Artist is completed. So if you had draw a paint stroke for example, you would get one frame written out when the stroke was finished drawing. The difference between this and AutoWrite is that AutoWrite could write out frame continuously as you did the drawing so the resulting movie would see the stroke being drawn as opposed to just popping into a new frame fully drawn. Enable Write on PASeq Cycle will automatically write out a frame at the end of a complete Paint Action Sequence (PASeq) cycle (when the PASeq has finished all of it’s steps). Enable Write on Gallery Show Cycle will automatically write out a frame at the end of a complete Gallery Show performance cycle. For more information on the new gallery show feature check out this tip. The actual playback rate of the generated Movie Stream is whatever you have specified in the File : Movie Codec Settings dialog. So if you have the Movie Codec Settings configured to generate a 10 fps movie then the generated movie stream will play back at 10 frames a second. Be aware that the AutoWrite FPS preference setting is the timing for how often frames are written out in real time. Not the playback rate for the generated movie file. So if you AutoWrite frames at 20 frames a second and have setup the Movie Codec Settings to generate a movie that plays back at 10 frame per second, then the screen drawing you captured in the movie stream will appear to playback at half speed. Loop Action is a new feature in version 4. When loop action is turned on using the Action : Run Loop Action menu command the current Studio Artist operation is run repeatably until loop action is stopped by pressing the space bar. You can import new presets when loop action is running and they will seamlessly be executed when the loop cycles. Using the favorites Preset Toolbar is a great way to quickly move between different presets when in loop action. If you have an open movie stream and the Stream: Enable Write on Op End menu flag turned on then at the end of each loop in a loop action cycle a frame image will be written out into the open movie stream. There are also menu options under File : Source Settings that can be turned on to enable the source movie to frame advance while loop action is running. The combination of loop action and movie streams provides a great way to use Studio Artist like a live video synthesizer where you can dynamically edit parameters in real time and see the effect on the continuously generated screen imagery while recording this generated imagery into a movie file. Using AutoWrite will record frames in real time. Using Enable on Op End will record frames after they are fully generated, and may be more effective if the operations you are running are slow. 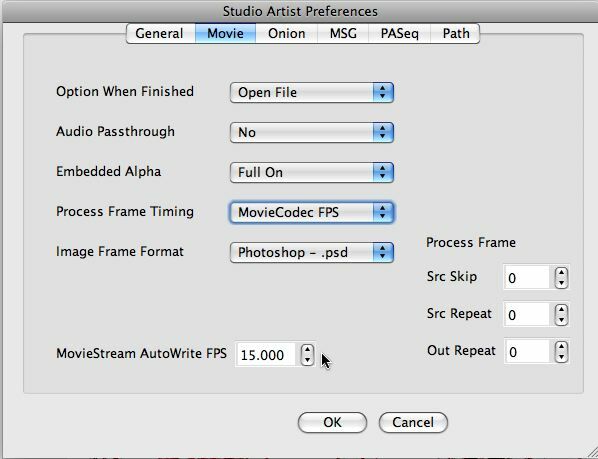 This is because the final timing of the generated movie stream is a function of the FPS setting in the File : Movie Codec Settings dialog. The AutoWrite rate is just the rate the frames are written out at, it does not specify a playback rate for the generated movie file. The perceived rate of motion events occurring in a movie stream is a function of the interaction between the AutoWrite frame dump rate and the FPS playback rate of the generated movie file.